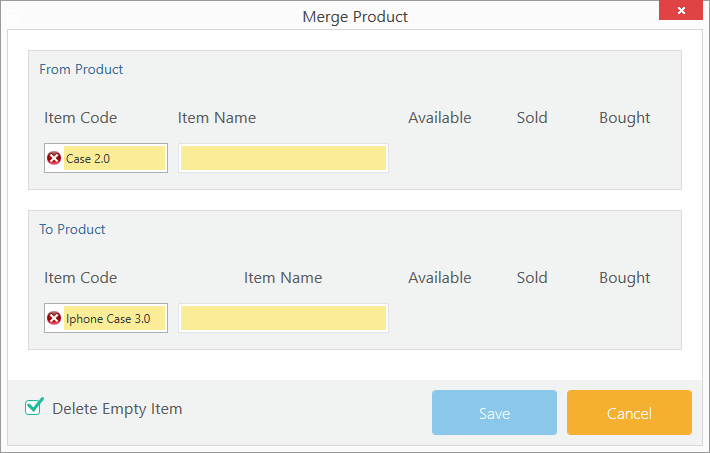 Merge product allows you to merge two products, creating a single product that will contain the information of both products. for example, if you have two products in your inventory with different names but both products are the same and have items in stock, you won't be able to delete any of those products. ( Product with items in stock cannot be deleted). In this situation, the merge product feature comes in handy, and merges both products together keeping their history at one place. Then, click on the Merge Product icon. In the From product field you may enter the product you wish to remove. In the To product field you may enter the product you wish to merge with( This will be kept). Optional: Select the delete option if you wish to delete the item that will be merged .